I am not buying any new yarn. At least that has been the plan for the past couple of months, and my plan for the foreseeable future. Having said that, I did have a little relapse. 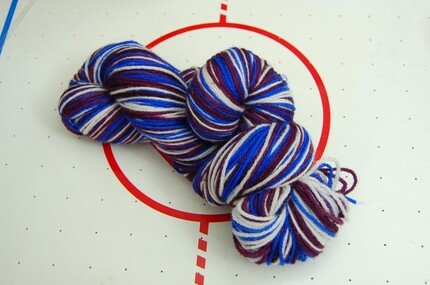 The one yarn I need the least is sock yarn, but I saw sock yarn that was dyed to match the colors of a favorite hocky team. Being a big Colorado Avalanche fan, how could I resist? It from an Etsy shop online called Draygoneyarnes. The yarn is 80% Superwash Merino / 20% Nylon, 100 grams/420 yds. My skein seems to have more white than the skein, above and the colors are less rich and vibrant. The yarn is fairly loosely plied and I'm not yet sure if I'll make socks. If I do, I'll need to reinforce the heels and toes, I'm sure. Maybe I'll make a little neck shawl to wear on game days. If I decide on a scarf, I'll have to pick one that looks good in a self-striping yarn. I'm on the same no-yarn thing myself, and it does get hard at times. The difference in colors is pretty amazing on the skein compared to the original photo. Oh, and I've started trying to finish my cabled sweater after seeing your Carmichael. 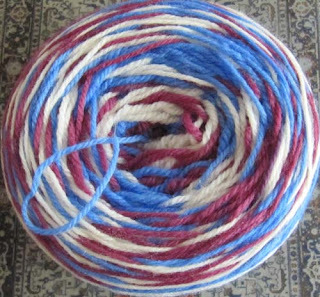 I LOVE that yarn, but honestly I think I'd be disappointed about the blue being so light. Go Avs! Ah, the ol' yarn diet. Hard to stick to, especially when team-inspired yarn is involved. Was it marketed specifically as a Colorado Avalance yarn? Wonder if she has LSU yarn - my sister in law would want some of that. Oh, and might I suggest "Simple Things" a sock yarn scarf/shawlette by Mary Heather Cogar? I don't know her, but I think it would be a divine pattern to do with striping sock yarn.